Google is no stranger to changing their algorithms from time to time, and yesterday was no different. Google has changed the way you see URLs in search results. The change comes as no surprise as google tries to improve usability for mobile devices. Google has offered up some details in their blog post from Thursday April 16th, 2015. 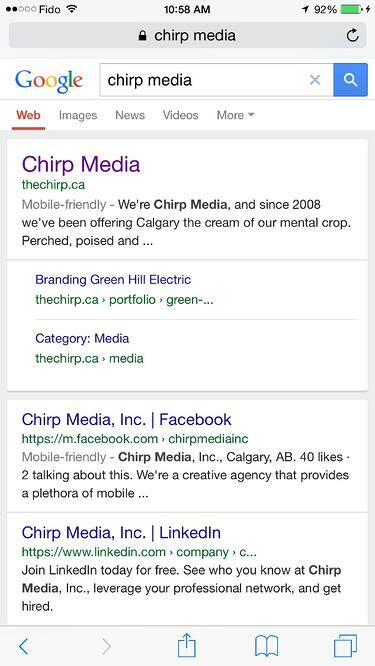 Chirp Media, in these results is thechirp.ca, Facebook is facebook.com. 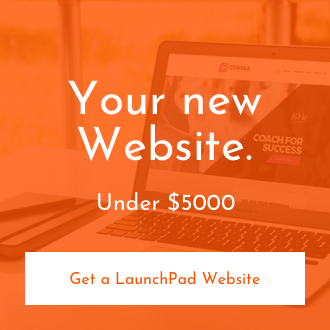 With this change the dominance of the domain name will disappear and your site name will be presented. So thechirp.ca will become Chirp Media and facebook.com will become Facebook. The biggest part of this change, is that it now means your site's URL structure has become even more important that it already was. Ugly URLs will now be more visible to the world, it also means that you will have to make sure that your site's name is reflected well in the search results. Leaving this change for Google to handle doesn't always lead to the best results, so we jumped over to google to get the skinny on changing that information. It was relatively easy. If you copy the markup above, make sure to replace the values of the url, name and alternateName with you own values before inserting this code into your websites homepage. You can either insert it into the head or body of your websites code. What this does mean in the end however, is that whatever you do choose as your brand name is now reflected more in the search results. So think really hard about what you want that to be. We have yet to see if this will affect keyword rich domain names, but we will keep you posted. If you are a Wordpress user jump on over get the Wordpress SEO plugin by Yoast, come Monday April 20th, 2015 they will be driving a new version that reflects these changes.